Whoever came up with the old adage, "you can't score if you don't shoot" must have had Alex Ovechkin in mind. Ovechkin is on his way to leading the NHL in goals for the second consecutive season. But he's also got a runaway lead -- again -- in shots on goal. Ovechkin reached the 400-shot mark for the third time in four seasons last Saturday during the Washington Capitals' 4-3 overtime victory at Boston. No other player has as many as 300 -- Carolina's Eric Staal is second at 293. Ovechkin is well on his way to surpassing his career-high total of 446, set last season when he scored 65 goals. The reigning Hart Trophy winner also had 425 shots as a rookie in 2005-06, when he scored 52 times, and 392 during a 46-goal season in 2006-07. Ovechkin’s season of 400 or more shots on goal is just the 13th in NHL history. Phil Esposito did it four times with Boston, and Espo holds the all-time single-season record of 550 shots on goal, set in 1970-71 -- when he scored 76 goals. Esposito is the only NHL player ever to surpass 500 shots in a season, though with an average of 6.6 shots per game, Ovechkin is in line to become the second. Despite sitting out Thursday with a heel injury, Ovechkin is on a pace to finish with 522 shots on goal. Esposito and Ovechkin are the only players in league history with multiple 400-shot seasons. The other six players who have reached 400 once are Paul Kariya, Bobby Hull, Bobby Orr, Brett Hull, Pavel Bure and Jaromir Jagr. Prior to Ovechkin, Kariya was the last player to surpass 400 shots with 429 in 1998-99. But Kariya wasn't nearly as accurate as Ovechkin, who has posted shooting percentages ranging from 11.1 percent to 14.6 percent in his 400-shot seasons. Kariya scored just 39 goals on his 429 shots, a 9.1 percent success rate. Not always on target -- Ovechkin would blow past Esposito's mark if he were a little more accurate. In addition to leading the League in shots on goal, he's once again No. 1 in missed shots with 167 -- Staal, who's second in shots, is also No. 2 in misses with 110. Ovechkin was also tops in misses last season with 199 -- far outdistancing runner-up Jarome Iginla, who had 117. Bad trip -- The Colorado Avalanche's idea of a nice winter weekend probably doesn't include this year's swing through the New York metropolitan area. The Avs became the sixth team to be swept without a point by the three New York-area teams (Rangers, Islanders and New Jersey Devils) when they lost 4-2 to the Islanders on Monday night -- a defeat that followed losses to New Jersey (4-0) on Thursday and the New York Rangers (6-1). Ironically, the Avalanche franchise was also the first team to be swept -- the Quebec Nordiques, who moved to Colorado in 1995, were blasted in their first swing through the New York area in January 1983. It's the third consecutive season a team has come to the metropolitan area and left empty-handed. Tampa Bay did it in October 2006 and San Jose was swept in three games last February -- after which the Sharks didn't lose in regulation for 20 games. Only three teams have ever come to the New York area and left with three wins. The most recent was the Anaheim Ducks, who allowed just two goals in their sweep last February. Lighting up the scoreboard -- It's a good thing for the goalies involved that the Calgary Flames and Tampa Bay Lightning don't play each other very often. 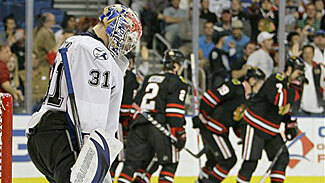 The Flames and Bolts combined for a season-high 15 goals in their only meeting last season, a 9-6 Calgary victory at the St. Pete Times Forum on Dec. 13, 2007. The teams didn't meet again until last Sunday in Calgary -- and they nearly repeated that performance. The visiting Lightning won 8-6, spoiling things for a sellout crowd at the Pengrowth Saddledome on a night that saw Flames captain Jarome Iginla reach the 400-goal mark and become the all-time leading scorer in franchise history. The 14 goals are the most in any game this season; there have been four non-shootout games that had 13 goals. The Flames were involved in one of those -- they beat Nashville 7-6 on Nov. 5. 3,000 and counting -- The Montreal Canadiens became the first team to play 3,000 home games when they stepped onto the ice last Saturday against the San Jose Sharks. The 3-2 victory gave the Habs a 1,836-756-382-26 all-time record in front of their home fans since being founded in 1909. Of those 3,000 games, 2,926 are listed as NHL games. Montreal has more home victories against Toronto (206) than any other opponent. The Boston Bruins are the only team with 100 victories (including one in overtime) at Montreal. The only visiting team with a winning record in Montreal is the Columbus Blue Jackets, who are 2-1-1 in their four visits. Wednesday night woes -- Montreal fans shouldn't have been surprised that the Canadiens struggled in Wednesday night's visit to HSBC Arena in Buffalo. The Sabres' 5-1 victory marked the ninth consecutive time the Habs have played in Buffalo on a Wednesday night and left without a victory. Their last Wednesday night win in Buffalo was a 4-3 victory at Memorial Auditorium on Oct. 17, 1990. Since then, the Canadiens are 0-6 plus a tie and two overtime losses, though they've hardly been gangbusters on the other six nights of the week, either -- they're 16-25-1-1 at Buffalo in non-Wednesday games since that victory.